I found a book called Tolkien and the Great War: The Threshold of Middle-Earth. Now, you may not guess from my apparent fetish for all things costume drama, historical fiction, and romance novels, but in my senior year of high school, I fell in thrall with The Lord of the Rings (and, admittedly, Orlando Bloom). I still count LOTR as one of my favorite books, though I could never do all the imagining and world-building to write fantasy. I'll stick to writing historically-set stories where the world building isn't as intense. I knew that J.R.R. Tolkien fought in World War I and that, in particular, his descriptions of Frodo, Sam, and Gollum walking across the Dead Marshes supposedly stemmed from things he had seen in No Man's Land. But nothing more specific than that. Tolkien and the Great War begins in Tolkien's school days at St. Edward's School, Birmingham, where his interest in languages and writing began. We're introduced to Tolkien's close friends: Christopher Wiseman, Rob Gilson, and G.B. Smith. Smith, like Tolkien, is a budding poet. 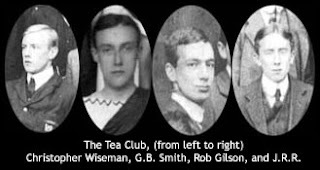 They called themselves the TCBS, short for the Tea Club and Barrovian Society. When war broke out, Wiseman joined the navy and Gilson and Smith joined the army. Tolkien was at Oxford when war broke out and did not join the army immediately. He wanted to try to complete his degree as he already had an idea that he wanted to become an academic. The book covers Tolkien's writing and imagining of his world. Quenya and Sindarin are created, influenced by Finnish and Welsh. A history of these languages is thought up. The Elves come into being. Places like Gondolin, in The Silmarillion, are written. Beren and Luthien are born. These are the first threads in Tolkien's enduring legends and reading about their creation in contrast with--or in reaction to--his surroundings made this a very special read. 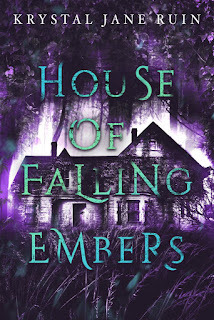 Because what writer, in some little way, isn't reacting to the world around them in their work, even if it seems like they are writing something completely unrelated, like elves, vampires or a setting two hundred years ago? Tolkien passed his poems on to his friends. In their letters, the TCBS write about the purpose of the TCBS, certain that they were brought together to change the world and that Smith and Tolkien, being the poets, were meant to change English literature. The letters were probably my favorite part of the book--to read about these men and read their voices, their debates, their questions about whether they were really meant to be great, what they wrote about their time in the war, and their reactions to Tolkien's stories and poems made the story so personal. My dear John Ronald, publish by all means. I am a wild and whole-hearted admirer, and my chief consolation is that, if I am scuppered to-night--I am off on duty in a few minutes--there will still be left a member of the great TCBS to voice what I dreamed and what we all agreed upon. ...May God Bless you, my dear John Ronald, and may you say the things I have tried to say long after I am not there to say them. Tolkien entered the army in 1916. He trained as a signal officer and was shipped to France in June 1916. The Battle of the Somme started on July 1st. Rob Gilson was killed leading his unit that day. His death was a huge blow to the TCBS. You can read more about Rob Gilson here. Tolkien fought during the Somme Offensive, as did G.B. Smith. Tolkien caught trench fever in October 1916 and was shipped back to England, where he spent the rest of the war. Smith was struck by shrapnel in November and died of infection in his wounds in December 1916. After the war, Tolkien wrote an introduction to a volume of G.B. Smith's poetry. I came away from this book thinking of parts of LOTR, written more than twenty years later, like the Siege of Gondor and the Ride of the Rohirrim. Writing breaks are great for reading. ^_^ I was a big fan of The Hobbit. I never got into LOTR, but I LOVE Gollum! I know a little bit about the Tea Club. I'm going to have to check that book out. I started with LOTR. Took me a few starts before I got into it, though. I only just got through The Hobbit recently. Like, last year. I wish I had a Tea Club. Though, with my friends, it'd more of a coffee-Chipotle-Five Guys Burgers-Club.